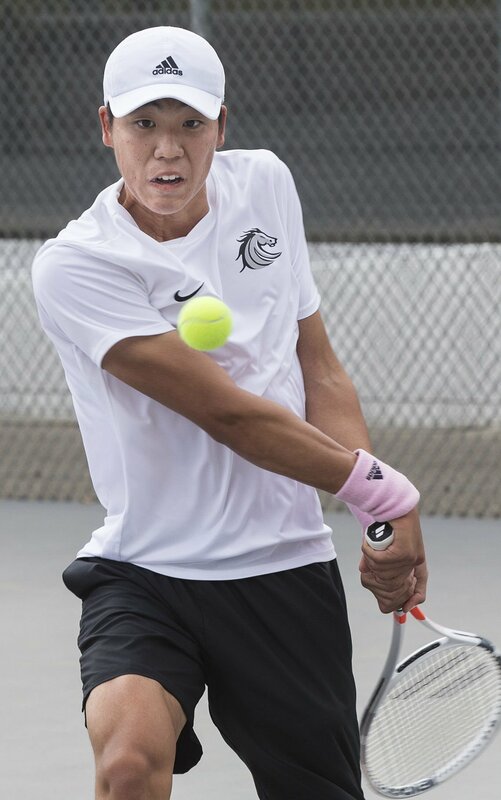 Nathan Kwon of Stockdale returns a volley in the finals singles match against Centennial freshman Brett Yackovich at the SWYL Tennis Championships at Stockdale High School on April 12. Nathan Kwon of Stockdale returns volley in the finals singles match against Centennial freshman Brett Yackovich during the SWYL Tennis Championships at Stockdale High School on Friday morning. Centennial freshman Brett Yackovich returns volley in the finals singles match against Nathan Kwon of Stockdale during the SWYL Tennis Championships at Stockdale High School on Friday morning. The Stockdale doubles team of Ethan Park and Vivek K. Gupta celebrate a service ace by Gupta against Liberty doubles team of Phillip Shafik and Sam Guimte during the SWYL Tennis Championships at Stockdale High School on Friday morning. Liberty's Phillip Shafik returns volley as doubles partner Sam Guimte covers the baseline during the SWYL Tennis Championships at Stockdale High School earlier this month. Liberty is the No. 4 seed in the Central Section Division I team playoffs and opens at home Wednesday against No. 13 Clovis East. He’s had plenty of fun during the 2019 season, including beating No. 2 Brett Yackovich from Centennial for the Southwest Yosemite League boys tennis singles title on Friday. Kwon, the top seed, won, 6-3, 6-3. He didn’t drop a set in any of his four league tournament matches. He focused on his service game and only things he could control, Kwon said. Even though Kwon won most of his singles matches early in the season, he felt like he started out slow. He hit a midseason funk around the Lynch Cup in March but snapped out of it by getting back to his fundamentals. Liberty’s Sam Guimte and Phillip Shafik won the SWYL boys tennis doubles championship for the second year in a row. It was Shafik’s third straight league doubles title because he won it with his older brother Nolan in 2017. The top-seeded pair took down Stockdale’s Vivek Gupta and Ethan Park in the first place match, 6-1, 6-0. Guimte and Shafik only dropped five games the entire tournament (no sets) and just one game in the title match. “They look like they're natural-born doubles partners,” Liberty head coach Stephanie Ollivier said. Shafik and Guimte took second in the Central Section boys tennis doubles tournament in 2018 after only playing together a few times during that regular season. This year, the duo had the benefit of playing together all year long. They were a bit timid last year, Ollivier said, because they had to adjust to playing with each other. The athleticism of the duo a season ago helped them overcome that gap. Now, they always know where the other person will be at all times, Ollivier said. “In our section, they’ve got a good chance of winning it the way they’re playing right now,” Ollivier said.